Fossils take millions of years to form and provide a record of the past. 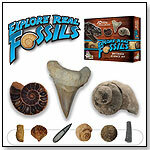 The Basic Fossil Kit features 10 specimens which include plants, sea creatures, dinosaur bones, sharks teeth and more. Also comes with a 25-page information guide.